The new Flipkart Mobiles Bonanza sale will let customers lay their hands on to their dream phones at very affordable prices. The Walmart-owned Flipkart has announced another edition of its Mobiles Bonanza sale from December 26 to December 29. The new Mobiles Bonanza sale will let customers lay their hands on to their dream phones at very affordable prices. 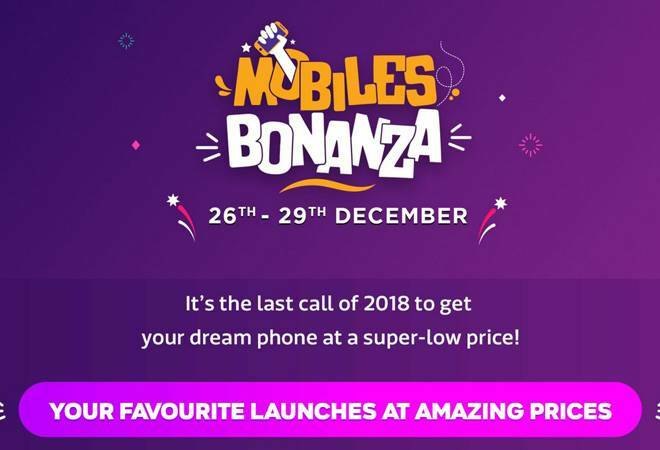 Flipkart has already declared it as "last call of 2018 to get your dream phone at a super-low price". Some of the top deals on offer include Realme 2 Pro, Asus Zenfone Max Pro M1, Nokia 5.1 Plus, Honor 9N and many more. There is also no coast EMIs and exchange offers and purchase buyback guarantees. Realme 2 Pro - Realme 2 Pro will be offered on Flipkart for Rs 12,990 during the Mobiles Bonanza sale. The smartphone was launched at a starting price of Rs 13,990 and after discount; it is one of the cheapest device with Qualcomm Snapdragon 660 chipset. The Realme 2 Pro comes with a 6.3-inch Full HD+ display and waterdrop-style notch. It is powered by Qualcomm Snapdragon 660 SoC. It has a dual rear camera setup with 16-megapixel and 2-megapixel sensors and a 16-megapixel selfie shoot. Zenfone max pro m1 - Asus Zenfone Max Pro M1 will be available at a starting price of Rs 8,999 during the Flipkart's Mobile Bonanza Sale. Flipkart will also be offering exchange offers, purchase buyback guarantee and smartphone secure solution starting at Rs 99 and no cost EMI. The phone has Snapdragon 636 SoC with 32GB or 64GB internal storage. Nokia 5.1 - Nokia 5.1 will be available for Rs 9,999 during the Flipkart's Mobile Bonanza sale. The phone has a 5.8-inch notched HD+ display, 3GB RAM, 32GB storage and uses MediaTek Helio P60 chipset. It features 13-megapixel + 5-megapixel dual rear camera setup and an 8-megapixel selfie shooter. Honor 9N - Honor 9N will be available at a starting price of Rs 8,999 during the Flipkart's Mobile Bonanza sale. It features dual 13-megapixel and 2-megapixel rear camera system and a 16-megapixel selfie camera. The smartphone is available in midnight black and sapphire blue colour. Asus Zenfone Max M2 and Zenfone Max Pro M2 - The Asus Zenfone Max M2 will be available at a starting price of Rs 9,999 while Zenfone Max Pro M2 can be bought at Rs 12,999 during the Flipkart's Mobile Bonanza Sale. Other than the above-mentioned deals, Flipkart is also offering discounts on Nokia 6.1 Plus, Honor 7S, Samsung's Galaxy On6 and Galaxy On8 in the Mobiles Bonanza sale. Smartphones like Asus Zenfone Lite L1 will be available for Rs 4,999 while Realme C1, Realme 2 and Motorola One Power will retail for Rs 7,499, Rs 9,499 and Rs 14,999, respectively. Besides, there are deals on and Apple iPhones during the Mobiles Bonanza sale.